Elevated polyclonal sFLC concentrations may result from decreased renal clearance and/or increased production. Increased polyclonal sFLCs may be a sensitive marker of B-cell stimulation. In patients with immune stimulation, polyclonal sFLC concentrations may increase 10- to 20-fold. In general population studies, elevated sFLCs are associated with increased mortality. In conditions associated with an increased risk of lymphoma (e.g. HIV infection), increased concentrations of sFLCs identify patients at highest risk. Figure 35.1. sFLCs in 25 patients with polyclonal hypergammaglobulinaemia (blue squares), compared with normal individuals (red crosses). Elevated polyclonal serum free light chains (sFLCs) associated with normal/near-normal κ/λ ratios result from increased polyclonal production, reduced renal clearance or a combination of both mechanisms (Section 3.5). Increased FLC production is due to proliferation of plasma cells and/or their progenitors. This is a common finding in diseases associated with immune stimulation and B-cell activation, such as infection, inflammation and autoimmune disease, and is often associated with high concentrations of polyclonal immunoglobulins. When immunoglobulin synthesis is increased, sFLC concentrations would, likewise, be expected to be elevated. This relationship was demonstrated in patients with polyclonal hypergammaglobulinemia who were studied by Katzmann et al. as a control group when establishing the reference intervals and diagnostic ranges for the sFLC assays (Section 6.1). 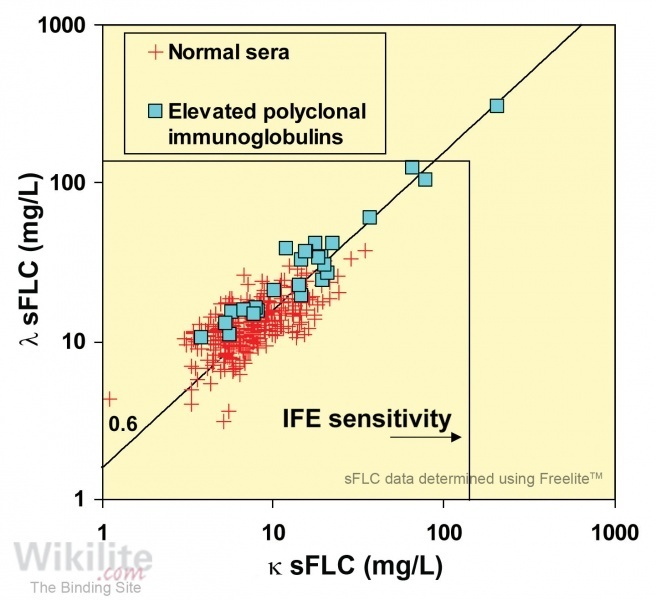 All 25 patients had elevated total immunoglobulins (18 - 39 g/L) but only a proportion had sFLC concentrations above the normal range, indicating a modest correlation between immunoglobulin and sFLC concentrations (Figure 35.1). However, some individuals did have sFLC concentrations raised 10- to 20-fold. The κ/λ sFLC ratios in this study were all within the normal range, in contrast to patients with renal impairment (Section 6.3). C-reactive protein (CRP) concentrations are widely used as a marker of both acute and chronic inflammation, yet comparisons of CRP and sFLC concentrations in different disease cohorts revealed only weak correlations, even after correction for renal clearance . Burmeister et al. concluded that polyclonal sFLCs and CRP provide independent information regarding immune stimulation/inflammatory status. Hutchison and Landgren  speculated that in the future, sFLC measurement might complement the use of CRP assays as a biomarker of inflammation. Many studies have now been published detailing the polyclonal sFLC increases in patients with a variety of diseases and these are reviewed below. Although sFLC concentrations are significantly influenced by renal function, they are not subject to the variable catabolism that limits changes in IgG concentrations (Section 3.5.3) and may, therefore, have some advantage over immunoglobulin or autoantibody measurements for monitoring disease activity. Increases in polyclonal FLC have also been observed in patients with haematological neoplasms, notably B-cell chronic lymphocytic leukaemia and B-cell lymphomas. These data are presented in Chapters 31, 32 and 33 . More recently, general population studies have revealed an association between polyclonal sFLC elevations and reduced overall survival, leading to the speculation that sFLC measurements could form a useful early investigation in general health assessments ; these studies are discussed below (Section 35.10).